Whether you call it a gimp, lanyard, scoubidou or boondoggle, you can weave and knot vinyl craft lace to create the colorful art of plastic lacing with our Promotional Moodoggle Key Ring Craft Kit. Custom print your logo or business name and message on the Mood Charm provided with our Moodoggle Key Ring Craft Kit. 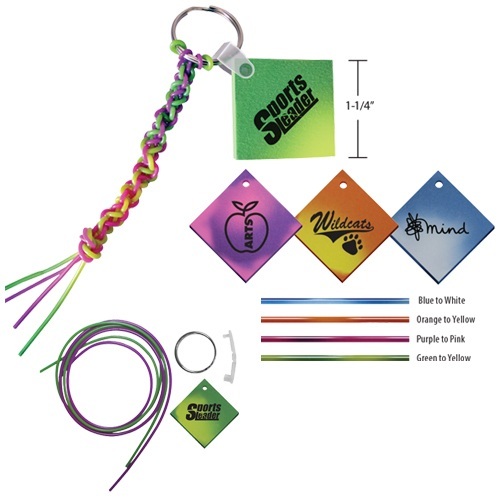 Each Kit includes your choice of 2 Mood String colors, custom printed Mood Charm, Charm Clip and Key Ring polybagged in a convenient craft kit, shipped unassembled with instructions. Mood strings and Charm change colors with the heat of your hands. Fun ice breaking craft kit for summer camps, Vacation Bible School and other events. Made in the USA. Moodoggle Kits are available with Mood String Colors in blue changing to white, orange changing to yellow, purple changing to pink, green changing to yellow. Mood Charm Colors available in blue changing to white, orange changing to yellow, purple changing to pink, green changing to yellow. Standard Imprint Colors provided at no extra charge: Black, White, Red, Lt. Blue, Med. Blue, Dk. Blue, Lt. Green, Med. Green, Dk. Green, Brown, Purple, Yellow, Teal, Orange, Maroon, Gold, Athletic Gold, & Silver. BLACK IMPRINT IS RECOMMENDED on Mood Charms provided in our Moodoggle Key Ring Craft Kits. Polybagged kit is shipped unassembled with instructions printed on polybag. Mood Strings are 24" long, each. Mood charm is 1-1/4" wide x 1-1/4" high.